ITALIAN Design houseGucciis feted for its impeccable craftsmanship and unfaltering attention to detail. Made in Italy from 100% Seta-silk, this tie is peppered with textured micro-neat woven - ideal for those who prefer a more understated look. Let it stand out against a crisp white shirt! 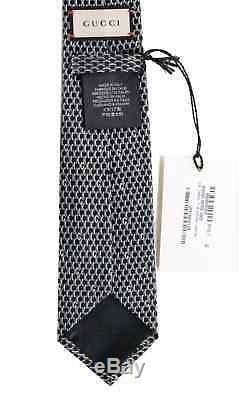 Gucci INGHI Men's Interlocking GG Woven Silk Necktie Black-Silver. Made in Italy: This Gucci item is guaranteed to be authentic. 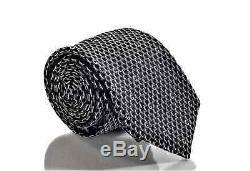 100% Silk- Woven Interlocking GG pattern tie-Blade Width: 2.75 IN (7 CM) approx. Dimensions: 58 IN (148 CM). Fine classic Interlocking GG patterned design. Partner with tailored separates or a full suit to complete the look this season. Lined with GG Logo Black silk satin. Logo keeper loop and bar tack at back. Gucci was founded byGuccio GucciinFlorencein 1921. So if you are not happy with our product or service please let us know. We will do everything to make you happy. The item "Gucci INGHI Men's Interlocking GG Woven Silk Necktie Black-Silver" is in sale since Friday, September 29, 2017. This item is in the category "Clothing, Shoes & Accessories\Men's Accessories\Ties". The seller is "runway_blvd" and is located in Sant Fe Springs, CA. This item can be shipped to United States, Canada, United Kingdom, Denmark, Romania, Slovakia, Bulgaria, Czech republic, Finland, Hungary, Latvia, Lithuania, Malta, Estonia, Australia, Greece, Portugal, Cyprus, Slovenia, Japan, Sweden, South Korea, Indonesia, Taiwan, South africa, Thailand, Belgium, France, Hong Kong, Ireland, Netherlands, Poland, Spain, Italy, Germany, Austria, Russian federation, Israel, Mexico, New Zealand, Philippines, Singapore, Switzerland, Norway, Saudi arabia, Ukraine, United arab emirates, Qatar, Kuwait, Bahrain, Croatia, Malaysia, Brazil, Chile, Colombia, Costa rica, Dominican republic, Panama, Trinidad and tobago, Guatemala, El salvador, Honduras, Jamaica.